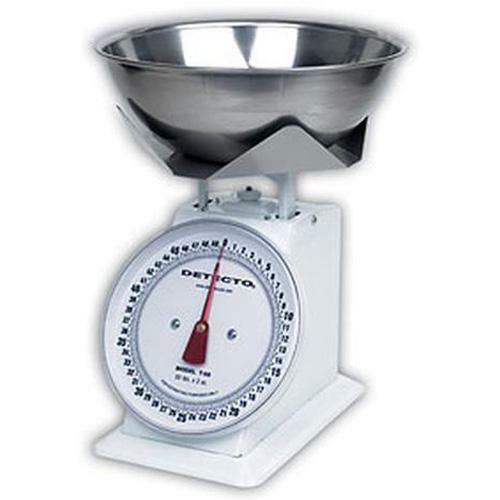 Detecto's NSF-certified TB series feature a stainless steel commodity bowl, measuring 4" high x 11.5" in diameter at the top of the rim (102mm H x 292mm), which sits cradled snugly in the 9" (229mm) square stainless steel platform. The special platform allows the easy removal and/or replacement of the bowl. For easy and thorough cleaning of the bowl, there are now rivet or bolt heads that collect dirt. These models fulfill the American's with Disabilities Act requirement when properly installed in place of a hanging dial scale. They are perfect for supermarkets and other establishments that are required to follow ADA guidelines of shelf and counter accessbility. The model TB series are the answer for the need of a high capacity mechanical scale for portion control and bulk weighing of commodities that are difficult to weigh on a flat platform surface.